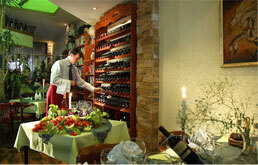 Enjoy the atmosphere, our cuisine and selection of drinks. In our restaurant and bar, anyone can feel the warmth and hospitality of our service. Ladies and gentalmen!This world is a park so that our souls can rejoice! What does the soul take delight in most? For every soul, all that is good is joy, for the cultivated soul, only the best is good enough! The best things for the soul are as follows: bread, salt and heart! Once, a man set out on a journey in pursuit of joy, resolute not to stop unless he finds is. When he arrived in Tetovo, he stopped: "Here the joy of my soul is! It is here that I have found bread, salt abd heart!" he told himself. "The moust delectable bread is baked and the most luscius fruits ripen when the scorching sun has warmed the soul of the fruitful Polog; the bright people, the inhabitants of Tetovo, have the best salt, the salt of reason; the heart thet never stops, beats entire eternity in the mighty chest of the majestic Sharr Mountain, erected above Tetovo!" Ever since then it is belived thet only hte one that will grab a bite of Tetovo bread, share the thoughts bedewed with the most refined salt of Tetovo spirit, and only the one thet will hear the pulse of the great heart of Sharr Mountain wil Surely find gladness for one's own soul! Once some people of Tetovo talked about what the origin of the name of their town was. A learned man, who spoke many languages, said to them. "Tetovo is full and beautiful like the egg of infinity. The ancient peoples considered the figure '8' as a symbol of infinity. In Albanian, 'tet' means 'eight'... " "Stop! The figure 'eight' you are talking about is not upright but lying!" somebody interrupted him. "Hold on! The second part of the mane (Tet)'ovo', means 'egg' in Latin. And the egg, no matter how you turn it, is not standing!" answered the clever man from Tetovo. Wishing to be far all concerns, the Pussian Kaiser Friedrich the Great built a place in Potsdam in 1747. Therefore, he called it "Sanssouci" - Ohne Sorge, meaning 'carefree'. If he succeeded, Tsar Friedrich the Great was the only one who had at least one resort where he cold be untroubled. 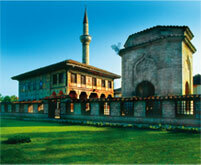 In Tetovo and Tetovo area, all people ava ehat only the tsar had, and all homes are tsar homes. Namely, one of the oldest proverbs here goes the saying. "My home first belongs to God, then to the guest! 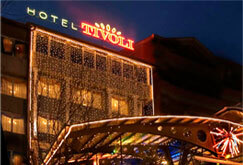 May both God and the guest be light-hearted here"
© 2011 Hotel TIVOLI, All Rights Reserved.